As appeared in The Times Tribune by David Singleton on June 16, 2018. 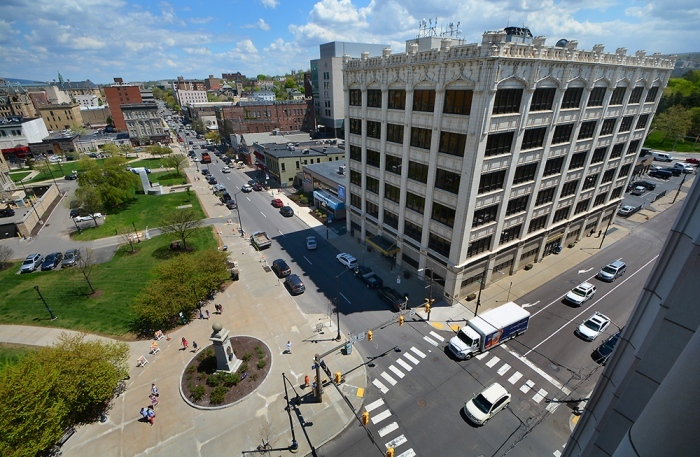 SCRANTON — Allentown-based developer Jefferson-Werner LLC submitted an apparent high bid of more than $1.6 million Friday for the Lackawanna County Administration Building. Jefferson-Werner outbid another developer, DFM Properties of Scranton, for the landmark six-story structure at 200 Adams Ave., which the county will vacate later this year when it consolidates government operations into the former Globe Store on Wyoming Avenue. Jefferson-Werner’s bid of $1,621,000 came in $321,000 over the county’s mandatory minimum bid amount of $1.3 million — the figure it budgeted this year for revenue from asset sales. DFM’s bid was $1.4 million. Commissioner Patrick O’Malley, who attended the bid opening with Commissioner Laureen Cummings, said they were happy with the outcome. “That is a great number,” he said, referring to the Jefferson-Werner bid. Pending a satisfactory review by county general counsel Donald Frederickson, O’Malley said the commissioners could vote as soon as June 27 to approve the building sale. Controller Gary DiBileo, who conducted the bid opening with members of his staff in the commissioners conference room, said both bids were received by his office about 1:57 p.m., just three minutes before the submission deadline. The county originally issued a request for proposals for the purchase of the Administration Building in 2017, and had two developers bite — Jefferson-Werner and DFM. The commissioners rejected both proposals in February, and said the county would instead solicit sealed bids and sell the property to the highest responsible bidder. In an attempt to drum up more interest in the building, the county advertised its request for bids in both The New York Times and The Philadelphia Inquirer newspapers, along with The Times-Tribune and The Citizens’ Voice, at a cost of around $10,000. Even though the advertising ultimately did not translate into additional bids, it grabbed the attention of out-of-town real estate interests, some of whom sent representatives to look at the building, said Andy Wallace, county chief of staff. Developer Charles Jefferson of Jefferson-Werner previously said his company, if it acquired the property, would retrofit the building with a restaurant, retail space and at least 50 apartments. The Globe, which the county bought for $1.3 million in 2016, is in the midst of a $17.4 million top-to-bottom makeover as the county government center. It is expected to be ready for occupancy by county employees in early December. Once the commissioners accept a bid, the county will have 10 days to produce an agreement of sale with the successful bidder, according to the timeline outlined in bid documents. The buyer will be required to make an immediate down payment of $10,000, with another $40,000 due by Oct. 1. The closing would happen no later than Jan. 18.